Creating vessels that are optimised to perform in the water is the focus of Associate Professor Jonathan Binns' research. The application of his skills in applied hydrodynamics is broad. He has designed yachts for the America's Cup, built sailing simulators for rehabilitation centres, and custom wave pools that consistently produce the perfect surfing wave. He is now turning his skills to solving problems for the naval defence industry. Associate Professor Binns coordinated the development, and is Director, of the ARC Research Training Centre for Naval Design and Manufacturing. The Centre is training PhD students to address issues specific to naval defence, which is a multi billion-dollar industry. 'We are working closely with the defence industry to solve problems in manufacturing, design and sustainment, to name the broad scope,' said Associate Professor Binns. Determining the best methods to mechanically maintain vessels that require constant operation over long life spans. 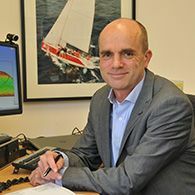 The challenging development of the ARC Research Training Centre is an achievement that Associate Professor Binns is very proud of, but he is equally proud of the simple design of the sailing simulator. 'The sailing simulator is based on very simple hydrodynamic techniques, but it is having an amazing impact on people's lives,' he said. Seeing people interact with the marine environment, sailing, surfing or doing their job for the nation, is what drives Associate Professor Binns in his research. He also loves the opportunity to work with industry to solve problems and uncover opportunities. Associate Professor Binns said that the Australian Maritime College at the University of Tasmania is the best place in the world to conduct research in applied hydrodynamics. A/Professor Jonathan Binns is the Associate Dean of Research for the Australian Maritime College and the Director of the ARC Research Training Centre for Naval Design and Manufacturing. Jonathan has specialised in hydrodynamics of maritime structures and vessels throughout his career as a research and design engineer and as a university based lecturer and researcher. A/Prof Binns started his research career whilst working as a design and research engineer at a dual role with Murray, Burns and Dovell Naval Architects and the Australian Maritime Engineering CRC after completing his MSc at Curtin University of Technology in 1996. This role allowed Jonathan to develop his engineering design and construction skills whilst still refining research projects in a number of industry centred projects, including one America's Cup campaign in 1997-1999. Following this period Jonathan completed his PhD at the Australian Maritime College, then secured a research engineer position with BMW Oracle Racing based in Valencia. In 2007, Jonathan returned to the AMC as a postdoc research fellow. In 2010 he was promoted to senior researcher and in 2015 to principle senior researcher in the field of maritime hydrodynamics. By taking a lead role in the organisation of research within the projects he has worked on, Jonathan has increased his capacity for research management considerably in recent years. In 2014 he took on the role of Director of the ARC Research Training Centre for Naval Design and Manufacturing and in 2015 he began as Associate Dean of Research for the Australian Maritime College. Jonathan's research aligns broadly with the theme of Marine, Antarctic and Maritime. The research fits within the breadth of this topic once the considerations of maritime platforms and their interaction with the environment are taken into consideration. Efficient use of waterways is vital to opening up of new environments to sustainable use by economies of the future. Maritime defence will always play a significant part in all maritime investigations due to the very extreme nature of the operating envelopes of such platforms. Jonathan's research in leisure industry based research work has additionally aligned with Better Health. Through Jonathan's work in sailing simulation, hundreds (if not thousands) of people have been introduced to the healthy sport of sailing. With collaborators worldwide using the sailing simulators for rehabilitation of spinal cord injury patients, the contribution to reducing the burden on health systems and increasing quality of life is a significant impact. With the work that Jonathan has been involved with in surfing wave pool design, a whole new healthy industry is poised to expand out into the wider community. A/Prof Binns currently has active collaborations with University of Melbourne, Flinders University and Wollongong University. The largest single project Jonathan is currently involved with is the ARC Research Training Centre for Naval Design and Manufacturing (see RTCNDM). This centre aims to produce industry ready PhD graduates, ready to make Australian research do more. This agreement will research, develop and improve the Computational Fluid Dynamics Large Captive and Free Running Modelsof the BB2 and other unclassified geometries, with validation against physical experimental data from MARIN, QinetiQ UK, and other facilities. A spectrogram is a useful mathematical tool for visualising the frequency components of a wave signal. While spectrograms are popular in many fields such as signal processing, they have only recently begun to be employed to study surface wave patterns generated by ships or vessels in open water. The project will implement new mathematical and computational models for simulating ship wakes and develop the theoretical foundations necessary to analyse the resulting spectrograms. Algorithms will be developed to help end-users predict the energy contained in a given ship wake. These results will have direct implications for monitoring damage to coastal zones, docked vessels or man-made structures by ship wakes. The project will focus on developing Computational Fluid Dynamic (CFO) simulations to predict the hydrodynamic coefficientsand the behaviour of submarines under a range of conditions and configurations. This will include bare and appended submarine hull forms, deep, near surface, and on surface operations, submarine manoeuvres, and appendages. These simulation models are to be validated and supplemented through captive scaled model experiments conducted in AMC's towing tank using the Horizontal Planar Motion Mechanism (HPMM). DST have been developing a computational fluid dynamics model which is capable of predicting the wake generated by a vertical surface piercing cylinder moving at a predetermined speed through a free surface. It is desirable to modify the computational model in order to predict the wake from a cylinder moving through a free surface that better represents a range of sea states as would be experienced in a real ocean environment. The aim of this project is to enable the existing CFD model to be upgraded so as to include realistic sea states and to validate the addition of waves to the simulated wake model against towing tank data collected from experiments of a vertical cylinder travelling through waves. This project will improve the BB2 CFO FRM model currently being developed jointly by AMC and DST, with validation againstphysical experimental data from MARIN. The validated CFO model will then be converted to a format that is compatible to the software operational environment of the Hydroacoustics STC at DST Melbourne. This is a postdoctoral position in submarine manoeuvring modelling. The Postdoc will undertake computational fluid dynamic simulations and model scale experiments to support the prediction of manoeuvring characteristics of generic submarine geometry. The aim of this project is integrating numerical, empirical and experimental results of the hydrodynamic forces generated by Ro-Ro thrusters affecting the stabilization of Articulating Concrete Blocks (ACB) revetments in terms of lift and drag. This project was divided into two stages: the physical experiments and the numerical experiments. The design of the Ro-Ro thrusters acting on the Ro-Ro ramp in a 1:10 scale wiII be created. A propeller, to stimulate the thruster of an ordinary Ro-Ro ship with diameter of 1.80m in full scale will be developed. The scaled model of ACBs revetment mattress type 3 will be placed on top of the designed beach ramp structure with two different slopes. The propeller wash running in shallow water will generate current and waves that will attack the beach revetment at different speeds. The velocity of the fluid will be verified using a Pilot tube at different points after the propeller hydrodynamic forces and moments acting on the revetment mattress will be measured using 6 degree of freedom load cells. An analysis of these forces and moments acting on the revetment mattress will be conducted however, the environmental loads (current and waves) and the hull effects will not be included in the model as this study is based on a stationary Ro-Ro ship and the forces generated by the hull and environment will be neglected. The empirical method of Pilarczyk and PIANC will be also used to calculate the stability of the flow and the revetment mattress. A comparison of physical experiments, Computational Fluid Dynamics (CFD) results and empirical method will be performed. The outcomes of this project are: verification of the performance and stability levels (scour forces: lift and drag forces and movements) of a scaled A CBs revetment. The aim of this study was to examine the viability of adopting some form of photogrammetry to measure the attitude of a vessel (trim, list and draught) in real time to aid the calculation of the total displacement of a ship as an alternative to traditional draught surveys.Physical scale model experiments were performed to measure the change in draught, trim and heel during a simulation of a typicalloading sequence for a bulk carrier. The measurement system was a form of photogrammetry a non-contact digital video motioncapture system. The physical measurements by photogrammetry were compared to calculations of a similar nature obtained from acontemporary hydrostatics software package.The study allowed the accuracy of the photogrammetry system to be assessed for measuring changes in draught, trim and list in realtime. The photogrammetry system was able to quantify differences in the model vessel's attitude to an equivalent level of accuracy in still water and also in wave affected conditions. Recommendations for future work were provided. The Training Centre will transform the Australian naval manufacturing industry by creating a new cohort ofindustry-focused, high-level and broadly skilled engineers and researchers. The resulting network ofengineering researchers will enable the industry to more rapidly innovate and solve key problems concerning the efficient design, construction and sustainment of naval platforms. This industrial transformation will bring significant benefits to Australia as it commences a very ambitious shipbuilding program comprising thedesign and manufacture of new fleets of submarines, future frigates and patrol boats. The success of these major projects is reliant on developing this cohort of researchers to solve the key research questions. Due to significant increases in fuel costs and the requirement to reduce greenhouse gas emissions, new multihull ship designs must now focus on reducing fuel costs and emissions as opposed to the quest for high speed. These new energy-efficient vessels need to operate in the critical speed zone where small changes in speed result in major increases in drag and trim. The project will develop new power prediction methodologies based on self-propulsion model and full-scale experiments, closely linked to computational investigations, leading to the development of new critical-speed multihull forms. The project will allow the design of the world's first circular track wave pool to proceed. The pool, capable of generating customised continuously breaking waves, uses a revolutionary idea proposed by industry partner Liquid Time. A disturbance is rotated on the perimeter of a circular wave pool to create breaking waves on a central sloping beach. Immediate outcomes will be: the ability to physically and numerically produce predetermined continuously generating breaking waves in a circular pool; the control of the wave transformation process; and design of the optimum moving disturbance. Use of a continuous steady-state wave will allow breaking wave analysis and fundamental knowledge of wave mechanics to be significantly extended.